(2011 Secret Santa) A gift that is Honey's alone. She wasn't, even though her canoe was laden so heavily with candlefish that each swell of the incoming tide lapped at the very edge of the boat. Honey could have shoveled some of her catch over the side until the canoe rode higher in the water � the solid little craft was wide-bottomed and stable, shaped expertly by Sunlight's hands, and she had no fear of it capsizing so long as it wasn't swamped.... But instead, Honey sat transfixed, her paddle in her hands, marveling at the strange beauty of the moment. The water of Eagle Bay was a dark gray beneath her boat. Surrounding her was a thick fog which rose the height of a cedar tree before clearing. Above the walls of mist that enclosed her, the late winter sun was dawning to the east, turning the sky overhead into a canopy of gold and rose, amber and shell-pink, pierced by only a fading morning star. The only sounds were the distant cries of gulls, and the gentle lap of the waves against the sides of her canoe. When the thick, pre-dawn fog had first enclosed her, Honey had been floating in the Braided River estuary, using a bag net to scoop up candlefish. Most of the rest of the fishers had stopped with the reversal of the tide � in just their first night of fishing at the peak of the candlefish run, they had caught a huge number of the finger-sized fish, which were now mounded on the beach to be smoked, dried, or rendered down for their oil. But Honey and her father had unloaded only half of their canoe's load of candlefish before Honey had traded verbal barbs with Flash and, in a temper, had set off again to work the outgoing tide alone. The candlefish didn't like fighting against the tide, so it took much longer to fill a bag net with the silvery fish, but Honey's effort was mostly just an excuse to avoid another encounter with Flash. She wasn't sure why her half-sister hated her so, but if was a choice between another few hours' work or giving the red-haired prankster the pleasure of seeing her in tears, Honey was determined to keep working until the canoe was carrying a full load. Honey had tied an anchor-line from the stern of her canoe to a tree branch along the river shore, then thrown her bag net over the side. The bag net had a long shaft, which near the bottom was split into two vertical poles lashed together above a single crossbar. It was the tension of the two poles spread wide that held the mouth of the long net open. The net itself was made of woven websilk and cordage braided from reeds, and was half as long as Honey was tall; when full of candlefish, it took every ounce of strength she had to haul it into the canoe, but there were few candlefish to be caught with the tide flowing out, so she found herself emptying it when it was only quarter-full. Enclosed by the thick soup of the pre-dawn fog and intent on rehearsing her most recent grievances with Flash in her mind as she worked, Honey had not realized that the tide was carrying her out to the sea until she'd slowly grown to realize that the gulls had awoken � and that their noisy calls were issuing from somewhere to her right and behind her. Honey had startled with that sudden sense of something amiss, and turned to see that her anchor-line was not taut against the outgoing tide as she expected, but instead limp and trailing in the water. She had grabbed the anchor-line and pulled it out of the water, only to find it neatly cut after about two spear-lengths. That would prove to be her half-sister's handiwork, Honey was certain of it � and at first, the sure knowledge that her tribemate's prank was going to backfire on Flash and result in a punishment was enough to keep Honey's fear at bay. She at once had pulled up her half-full drag net, then tried to use her bag net to find the bottom and pole herself back to shore. No such luck � the tide had already carried her out into Eagle Bay, and would carry her farther out to sea if allowed. Honey had been gratified by the immedate attention her sending had received. She had pulled out her paddle and started paddling, hoping to reach shore by her own efforts. But in the strong tidal flow, Honey did not make any headway. If anything, the raucous noise of gulls trying to steal from the tribe's candlefish catch only grew more and more distant. Honey had howled, and heard their howls in response. But sound carried deceptively in the thick, dense fog. She could have been a bowshot from the shore where the candlefish were being hung from poles to dry and they could have still sounded a mile away. Likewise, at odd moments, the screams of gulls wavered and grew, sounding as though they were just over her shoulder. Stormdancer would find her. Honey did not doubt that. She just didn't expect it to happen quickly, and she didn't want the tide to have carried her all the way to sea by then. So keeping the ghostly calls of the gulls always to her left, she grit her teeth and kept paddling, while the darkness around her faded with the coming of the dawn. Now, with the dawning sky overhead turning shades of rose and gold, Honey sat with her paddle in her hands, gazing at the beauty overhead. The canoe rocked gently, and the thick mist which enveloped her left her feeling not isolated, but instead, embraced and at peace. The elves were not the only ones drawn to Eagle Bay after the candlefish runs. Two dark, sleek heads broke the water, within reach of her paddle. The seals gazed at her, their round eyes dark and doe-like in their mottled gray faces. After a moment, a third surfaced as well. They stared at her, an invader into their liquid world. Honey stared back at them, then on a whim, caught up a handful of candlefish from the mound which weighed her canoe down on the water. She cast the silvery offering at the water between the canoe and her visitors. Two of the seals dived underwater, perhaps in pursuit of an easy meal. The third blinked at her for several heartbeats longer before easing away under the gray surface of the bay. Somewhere to her left came a howl. It sounded distant at first, then wavered in tone and shifted, as though the howler had leapt a huge distance in just a blink. Honey lifted her chin and howled back to Stormdancer, knowing her elder would be soon arriving to her rescue. Then the canoe rocked alarmingly. Honey aborted her howl, and her eyes snapped open and searched about her in surprise, as she tried to steady her craft by application of the paddle off the boat's left side. A dark mound had surfaced, replacing the seals; a huge, sleek black shape, with a single fin breaking the water a distance behind it. There was a blast of droplets as the great sea-hunter exhaled from its blowhole, and then Honey could see the wide white ovals above the eyes and the white of its lower body, beneath the surface of the water as it considered her curiously. A sea-wolf. One of the great sea-hunters. Honey had heard stories of the creatures, but never seen one with her own eyes. Honey held her breath in wonder as the creature seemed to regard her, its body several times the length of her small canoe. Once again, Honey knew she should be afraid. 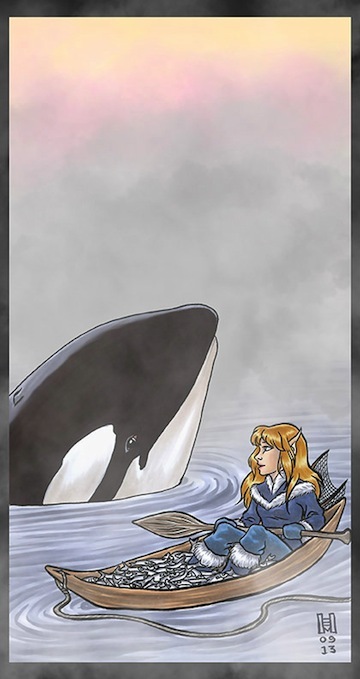 She knew the sea-wolf swam in packs and ate seals, and would even hunt and kill larger whales. If it were hungry, it could easily swamp her canoe and make a meal of her. Even if it weren't hungry, it could still easily swamp her craft and drown her, just by moving suddenly and making a strong wave. Honey held her breath and watched it. In return, the huge head moved slowly, rising up until even the white chin was out of the water. One huge, lidless eye studied her. Honey slowly put down her paddle, as though it might be perceived as a weapon. **Hello,** Honey locksent to it. Her mind-touch met with awareness, and then a sense of a deep and crafty intelligence, utterly unlike an elf or a wolf. In return, Honey felt a pulse of amusement-laced curiosity. It was conscious of her, it knew her as a fellow thinking creature. Its eyes saw her, and wondered about her in return. Then as silently as it had arrived, the sea-wolf slid down into the water, with such gentleness that its descent caused only ripples of water to kiss the sides of Honey's canoe. Honey swallowed and, only with difficulty, found her voice. �Did you see it?� she asked. Honey hesitated, then simply moved to tie the glider's rope to the bow of her canoe. If Stormdancer hadn't seen the sea-wolf, then Honey did not need to tell her about it. No. Honey's moment of communion with the sea-wolf had been a gift � and it was Honey's alone.